A Trump-supporting West Virginia Republican delegate who came under fire last week for comparing gay people to the Ku Klux Klan and calling LGBTQ organizations “opponents of freedom” and “brutal monsters” now says he was just joking when he told a reporter he’d like to see if his children could “swim” when asked what he would do if they came out as gay. 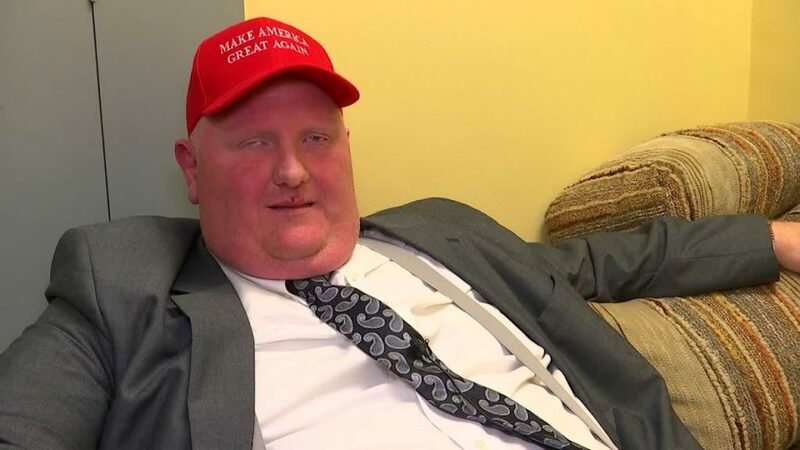 West Virginia House of Delegates member Eric Porterfield (R-Mercer County) was asked by a WVVA reporter “what would happen” if his son or daughter came to him years from now and revealed that they might be gay or lesbian. “What do you mean you would see if they can swim,” the reporter asked, appearing somewhat shocked by his answer. “I just want to make sure they could swim,” he repeated with a grin. “What do you mean by that,” she asked again with what appeared like nervous laughter. “That’s it. I mean I would take them out to do activities,” he replied. “Okay,” the reporter said before moving on. The West Virginia freshman lawmaker first came under fire when he compared “the LGBTQ” to the KKK in an interview Friday morning, Charleston’s Gazette-Mail reported. “The LGBTQ [sic] is a modern day version of the Ku Klux Klan, without wearing hoods with their antics of hate,” Porterfield said. Porterfield also called the LGBTQ community a “terrorist group” and claimed that he is being “persecuted” in retaliation for comments he made during a House Government Organization Committee meeting two days earlier, the newspaper reported. During a Wednesday committee meeting, Porterfield made a speech in support of an amendment that would have prohibited municipalities within the state from adopting non-discrimination ordinances protecting sexual orientation and gender identity. The Gazette-Mail reported that Porterfield used the anti-gay slur “fa-got” in the meeting, within the context of quoting the name of a speaking tour that uses the term in its title. Porterfield claimed in a social media post Friday that he had contacted law enforcement after continuing to face harassment from LGBT activists over his support of the amendment. The proposed amendment to House Bill 2699 was ultimately killed in committee. The post GOP Lawmaker Who Implied He’d ‘DROWN’ His Gay Kids Now Says He Just Said It To Own The ‘Liberals’ appeared first on The Gaily Grind.